The storm track over the next five days will undergo a significant shift. Initially, very cold air hits the Northeast through Saturday then the pattern flips with warmer air surging in. Across the West, the pattern gradually turns stormier. In other words, a ridging jet stream gradually buckles with two different large Pacific storm systems moving inland. We remain on El Nino Watch with a 65 percent chance of a full-blown El Nino occurring before the end of winter according to official forecasts. However, I remain doubtful that it will occur. I've watched South Pacific sea surface temperatures cool since December and the latest suite of computer forecast models are not in favor of a surging El Nino pattern. Two storm systems are lined up. The first arrives Thursday afternoon and continues through Saturday morning. The second storm arrives gradually by Saturday night and continues into Monday. 1-2 foot grand totals on the high Cascades and volcanoes by Tuesday morning. A great stretch ahead. Snow is likely between Thursday night and Saturday afternoon. Another push of snow is likely between Sunday and Monday night. Two storm systems are lined up. The first arrives Thursday midday and continues through Saturday morning. The second storm arrives gradually by Saturday night and continues into Monday. 1-3 foot grand totals on mid/upper mountain by Tuesday morning. 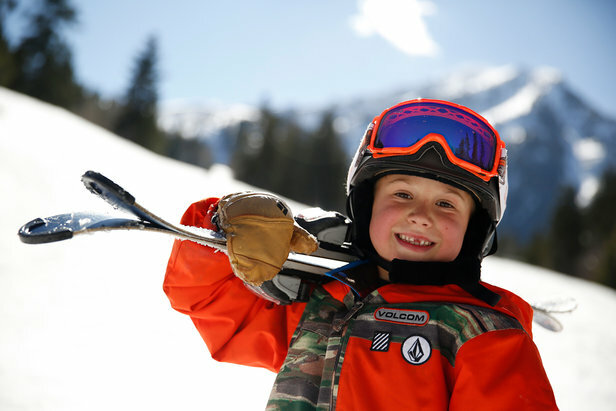 The best skiing occurs Saturday and Monday. Light snow brushes Mammoth and the middle/south Sierra on Thursday. Two larger storm systems are lined up. The first hits Tahoe and the Sierra starting Friday afternoon and continuing through the weekend with the second storm system on its heels. The second storm arrives Sunday afternoon continuing through Monday and possibly Tuesday morning. 1-2 foot grand totals by Tuesday morning at Tahoe south to Mammoth. Two storm systems are lined up. The first hits Utah on Saturday morning and tapers off on Sunday. The second storm begins Sunday night and continues into Tuesday. Heavy snow accumulation is likely with both storm systems. We could be talking about feet of snow again at the Wasatch ski areas. These are southern track storms so Brian Head will also get heavy snow accumulation. In Colorado, the first storm system arrives Saturday afternoon and tapers off on Sunday afternoon. The second storm system arrives gradually on Monday and continues into Tuesday. Heavy snow accumulation is likely and appears to benefit the Western Slope ski areas most prominently. That includes Aspen/Snowmass, Crested Butte, Steamboat, Telluride, Purgatory, Silverton and Wolf Creek. Other ski areas closer to the Divide will also get heavy accumulation but not quite as much. 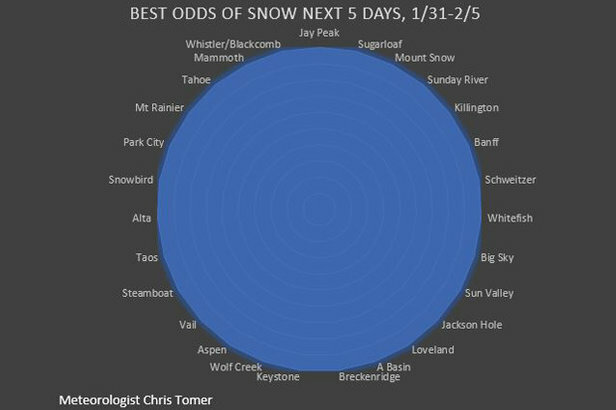 Ski Resorts with the best chances for snow through this weekend, 1.31.2019. Excellent snow continues with two storm systems lined up. The first arrives on Saturday and continues into Sunday with heavy snow accumulation. The second storm arrives Monday and tapers off by Wednesday morning. Heavy snow accumulation again. 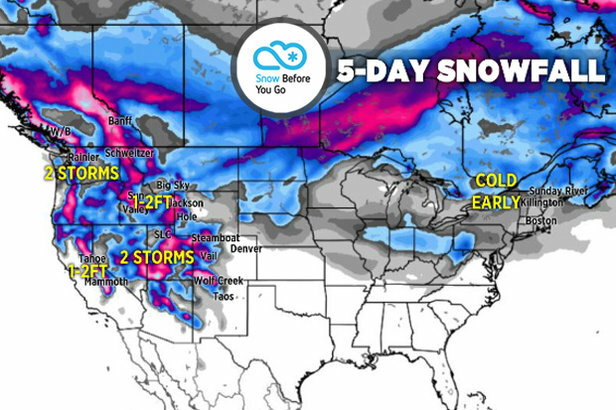 Look at Sun Valley, Jackson Hole, Grand Targhee, Bridger Bowl and Big Sky on Sunday-Tuesday. Look at Schweitzer and Whitefish on Monday and Tuesday. Two storm systems are lined up. Taos and Angel Fire are in good position. Both storms are southern track storms, which is the best track for New Mexico. Powder skiing starts on Sunday. Lingering, scattered snow showers continue on Thursday and possibly Friday along with very cold air. A clipper brushes parts of New England with light snow on Saturday. Then temperatures start to gradually warm on Sunday-Tuesday. Rain/snow is possible Monday-Tuesday with a storm system. The best skiing occurs on Saturday and Sunday.